We acknowledge the generous support of IIT Ropar, Eyeris Inc and Samsung for funding our research. For collaboration, industrial consultancy and research funding please email Dr. Abhinav Dhall. Abstract: Understanding of emotion of a group of people in an image or video is an imporant problem. 1. Shreya Ghosh, Abhinav Dhall and Nicu Sebe, Automatic Group Affect Analysis in Images via Visual Attribute and Feature Networks, IEEE International Conference on Image Processing 2018. 2. Abhinav Dhall, Jyoti Joshi, Karan Sikka, Roland Goecke and Nicu Sebe, The More the Merrier: Analysing the Affect of a Group of People In Images, IEEE Automatic Faces & Gesture Recognition (FG) 2015. Abstract: We are working on the problem of automatic prediction of a student's engagement in e-learning (MOOCs) environment. The Engagement prediction in the wild database has been collected at IIT Ropar. The aim is to capture different environments `in the wild'. The database is part of the Emotion Recognition in the Wild challenge. 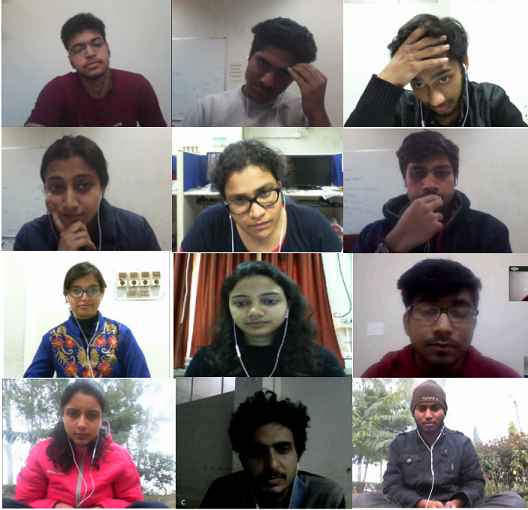 1.Amanjot Kaur, Aamir Mustafa, Love Mehta and Abhinav Dhall, Prediction and Localization of Student Engagement in the Wild, https://arxiv.org/abs/1804.00858.